I never imagined that 49ers Webzone would one day have the massive fan following that it currently enjoys. It is a site that is run by San Francisco 49ers fans for 49ers fans. Each staff member works very diligently to maintain and continually improve this site. Most of the credit has to go to those that volunteer their free time to write for, program and moderator the site. Without them, this site would not have become what it is today. The maintenance of this site takes up a lot of time for those involved. This includes everything from daily news updates and newly added features to moderating the busy online community that the site enjoys. Our love for the team and the community that we have created keeps us moving forward. I first wrote this section as a celebration of 49ers Webzone's 100,000th visit. That was back in January of 2000. As of April of 2014, this site has been visited over 200,000,000 times and we thank all of the visitors who have made 49ers Webzone a stop on their daily web surfing schedule. This site was born in April of 1997. The internet boom resulted in everyone with an opinion having a personal website. It was not until a computer class at UCLA that the Webmaster was forced to create a site. He really had no idea what to put on it. There were a few pictures, some information about himself, and a small tribute to the San Francisco 49ers on the newly created and UCLA hosted web site. While he really enjoyed creating the site, he had no idea that this was the start of something big. Eventually, the site moved from UCLA's student servers to a free web hosting service. While it had no true direction, the link was posted within a few online directories and the site started to get a few visitors each day. The excitement grew and all of the Webmaster's personal information from the site was removed and the sole focus was redirected toward the 49ers. At the time, the site was mostly visited because of the image gallery that was in place. That summer, the Webmaster decided to learn a little more about his newfound hobby. He purchased an HTML book and studied up a bit. That September, he bought a computer for school, started visiting many other 49ers sites to learn how they did things, and tried to figure out how he could offer something that they did not have. Back then, Spike's 49ers Page was the top 49ers fan site on the web and probably the best resource for 49ers information anywhere. Sadly, it no longer exists. He came across a site called The 49ers Zone which was run by a Timothy Imrick. Timothy had created such a great looking site so the Webmaster took a shot in the dark and decided to contact the him. They quickly started exchanging emails and talking via ICQ (an instant messenger at the time). Timothy showed him some tips and tricks in basic coding, which seemed advanced at the time. Things on this site were moving along thanks to all his newfound knowledge. 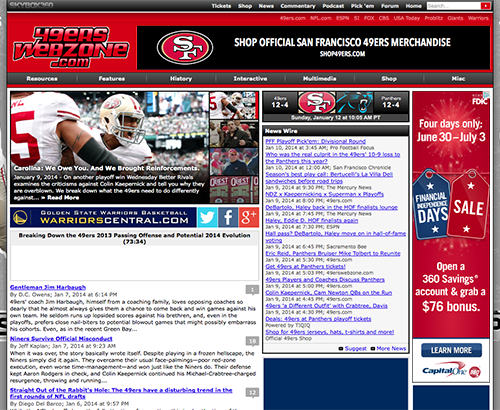 At the time, the site was known as The 49ers Homepage. The site now had 20 to 30 visitors a day. That seemed like a lot of people at the time and more fan sites started linking the site. It was even referenced on Spike's 49ers Page, which was huge at the time. Soon that 20 to 30 visitors turned into 40 to 50. Keep in mind that no one the Webmaster knew really had a site that anyone other than friends and family were interested in viewing. It was so unbelievable and fairly entertaining. Content grew gradually, but it wasn't always the prettiest of packages. Soon, it became too much for one person to manage and help was needed. A limited staff joined the site and started writing original content. With this content, the site's popularity continued to grow. Before anyone had realized it, the offseason following the 1997 season had passed. Despite the lives of the staff becoming busier and busier, the site continued on. Once the 1998 NFL season started, more and more fans flocked to the site. Visitors per day were now in the hundreds. Spike's 49ers Homepage was no longer being updated and the 49ers Zone had disappeared. Timothy went on to help with the 49ers message board on a community site and would eventually join this site for a short time. Things were taking off as more staff members jumped onboard. Things were going well for the team and with that, interest in the site grew. What really shocked some people was the change of the layout. It was a massive overhaul from a black background, frame based site, to a white background, table based site. The layout was cleaner and content was a bit simpler to locate. Fans started to see that the site was serious about covering their favorite NFL team. The season went by and we did our best to cover it by delivering content from all over the web. People did not really enjoy scouring the web for 49ers news and updates so the goal turned into becoming a one stop hub for news from all over the web. With the increase in content and visitors, the site needed a new name. The 49ers Homepage just was not going to cut it anymore. The 49ers Webzone was born. During 1999, the site was now getting over 400 visitors a day. The layout of the page changed once again, but not as drastically as the previous change. The 49ers Webzone had become the official 49ers content partner for the now defunct XSlant.com and joined a group of NFL fan sites called the Fan2Fan Alliance, which is also no longer in service. The goal of this was to increase our reach to the sports community. The season started, traffic increased, and the staff continued to work hard at improving the site. However, it was still a smaller site and as always, fans had a number of alternatives. Something needed to be done to attract more users to the site. For the first time ever, we were looking to actually spend money on this fan created project. 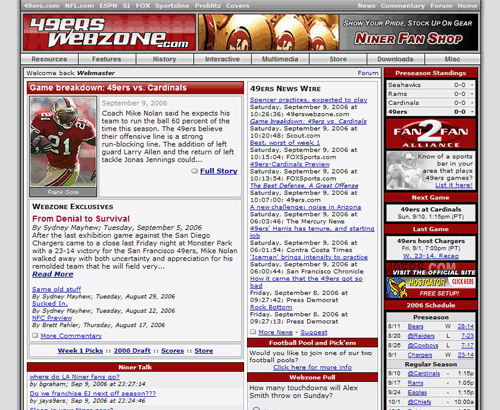 In 2000, 49ers Webzone acquired 49ersfootball.com and the domain 49ersfootball.net. While plans to replace the 49ers Webzone name were in the works, nothing ever came of it since we had already started a brand. At the time, the NFL was looking for any reason to shut down popular fan sites. 49ers Webzone was even approached by the San Francisco 49ers organization in an effort to close the site down. After much discussion, an agreement was reached that allowed the site to continue. Eventually, the NFL grew to understand that fan sites simply add another level of free advertising for their teams and only increase a team's popularity. To this day, 49ersfootball.com and 49ersfootball.net still redirect to 49erswebzone.com. 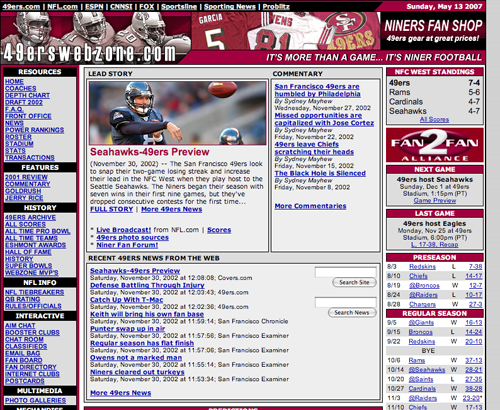 By 2001, the site was simply referred to by its domain name, 49erswebzone.com. It was finally decided that a move to a reliable hosting provider was necessary and it adopted a more professional format. The implementation of a community message board in late 2000 brought about the first interactive aspect of the site. Costs went up, but so did the traffic. With these new costs, the decision to include advertising on the site emerged. Still dedicated to serving the fans as the staff had been doing for many years, there was the need to cover the new costs of maintaining the site. By 2002, over 3,000 visitors a day came to 49erswebzone.com. By 2003, that number reached over 4,000 visitors. With a small online community now forming, the site added online postcards, chat rooms, downloads, a fan directory, store, and much more. The number of staff writers increased and things seemed to be rolling along. While a little competition is healthy, the need to team up with a number of other 49ers fan sites became necessary and helped to increase all of our exposure. Relationships were built and the sites even worked together on certain projects in an effort to deliver the best fan experience possible. An example of these relationships includes the interaction between 49erswebzone.com and 49ersparadise.com. The two sites work together during the NFL Draft, shared a chat room and combined fan question and answer sessions with various experts. "My stepson is a big fan of the 49er's. He was in an accident 2 years ago & is paralized from the shoulders down. I send him updates on the 49er's from this site. We're so glad you're here." This was one of the many examples from fans that kept us going during the early years. As of April 2007, 49erswebzone.com was visited by over 35,000 fans a day. The 49ers fan community became one of the most active football communities on the internet. Friendships have been created, relationships have been formed and a sense of family is enjoyed by some of the members. Our goal is still the same. 49erswebzone.com became the fans' online resource to everything 49ers related. Whether you were looking for the latest news or just wanted to become part of the 49erswebzone.com community and make some friends, this site delivered. This site is officially owned by Skybox 360 Media LLC, which primarily runs a number of sports sites, many of which for Bay Area teams. However, this site was the one that started it all. In 2010, a partnership was made with Big Lead Sports, which would later be acquired by USA TODAY. Being a partner with USA TODAY Sports allowed access to resources including use of team photos, contact with different affiliates, and shared advertising. Since 2005, forum members have been organizing a tailgate at 49ers home games. On Tuesday, March 13th, 2007, 49ers Webzone received its 20 millionth visit to the site. On Friday, April 4th of 2014, 49ers Webzone received its 200 millionth visit to the site. April of 2012 marked 49ers Webzone's 15th anniversary.